Or as low as $37.42 per month over 12 months. Apply Now. Need to set up a small stereo system in a bedroom, office, or dorm? 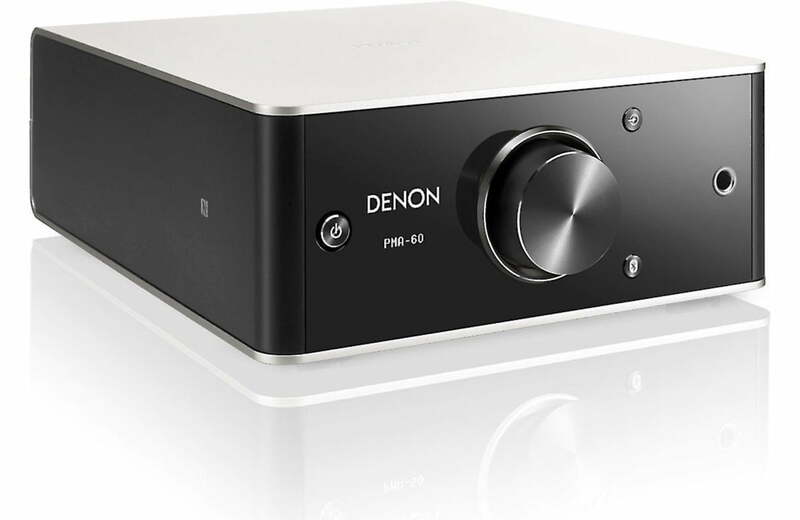 The Denon PMA-60 packs the powerful big-system punch you crave into a compact package that fits almost anywhere. Stand it on its side for placement on a desktop or shelf, or lay it flat in a cabinet or rack — it will automatically detect its orientation and adjust the OLED display accordingly. With its array of digital and analog inputs, built-in DAC, and Bluetooth, the PMA-60 is ready to play great-sounding music from a variety of sources. This little amp makes MP3- and CD-quality music sound great, plus it decodes high-res audio files for better-than-CD audio quality. 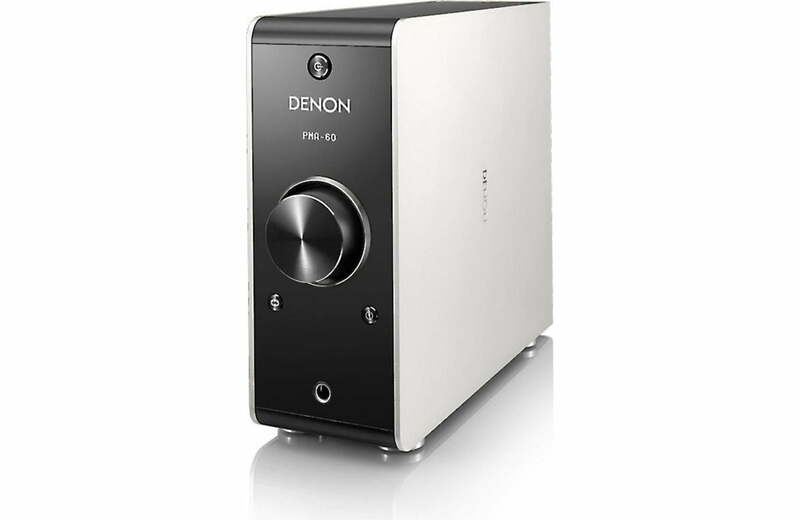 Denon’s advanced AL32 processing upsamples non-high-res digital audio, so even compressed music sounds better. Want to enjoy your music without disturbing others? 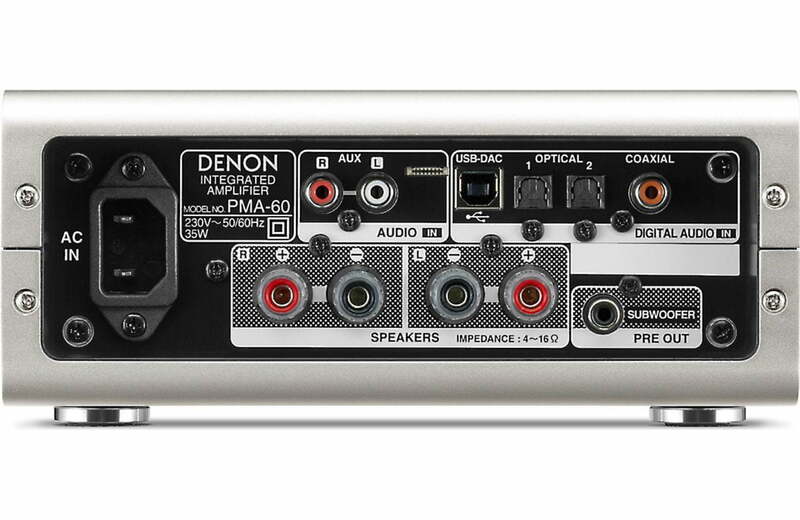 The PMA-60’s built-in high-quality headphone amp accommodates all sorts of headphones.When it comes to audio gear, the Denon PMA-50 conventional wisdom always seems to favor big over small. Big speakers. Big amps. Big everything. But not every room is right for a large-scale sound system. For a bedroom, dorm room, or the desktop in your home office, a small setup may simply make a better choice. That’s why Denon created the PMA-50 integrated amp. This little mighty mite packs the powerful, big-system punch you crave into a compact package that fits neatly almost anywhere. With its built-in digital-to-analog converter, Bluetooth® streaming, plus an array of digital and analog inputs, the PMA-50 is ready to play beautiful music from a wide variety of sources such as smartphones, disc players, a TV, or a computer. Enjoy high-resolution stereo sound with the Denon PMA-60 Digital Integrated Stereo Amplifier. The unit features a Class-D amplifier section that incorporates Qualcomm DDFA technology to produce a nuanced yet powerful sound with up to 25W of power per channel at 8 Ohms. When connected to a Mac or Windows computer via the USB-DAC port, the integrated DAC utilizes Advanced AL32 digital audio processing to playback PCM files up to 384 kHz/32-bit, with enhanced dynamic range and improved resolution at low level. The PMA-60 allows you to input digital audio signals via two optical ports and one coaxial port. The stereo RCA aux input lets you connect an analog device such as a CD player. Bluetooth connectivity with NFC and aptX low latency enables you to stream audio tracks from your Bluetooth-enabled portable devices, with no lip sync issues when playing back audio from video sources. The headphone output on the front panel features an adjustable output impedance, to ensure optimal sound quality, whether listening to your music with home or professional studio headphones. A crisp OLED display shows the source selected, the sampling frequency and data format, as well as the volume setting when you turn the volume knob. The PMA-60 ships with a remote control and a USB cable. Class-D amplifier section incorporates Qualcomm DDFA technology, which realizes higher signal-to-noise ratio and lower distortion compared to conventional Class-D amplifiers. 25W + 25W output at 8 Ohms delivers a nuanced yet powerful sound. The PMA-60 features the company’s Advanced AL32 digital audio processing system, for high-fidelity with your favorite digital audio tracks—also used in Denon’s premium audiophile disc players and digital audio components. Advanced AL32 processing converts 16-bit audio signals to 32-bit and 44.1 kHz sampling signals are up-sampled by 16x, to achieve a smoother recreation of sound waves. Data interpolation achieves distortion-free rendering, accurate sound localizing, and rich bass that is faithful to the original sound. Delivers enhanced dynamic range and improved resolution at low level. Connect your Mac or Windows computer via the USB Type-B input on the back panel. Play back high-resolution PCM files up to 384 kHz / 32-bit along with high-resolution DSD 2.8, 5.6, and 11.2 MHz files. Noise isolation block prior to the digital amplifier and D/A conversion block prevents digital noise from degrading the audio fidelity. USB Type-A to USB Type-B cable is included. Compatible with a wide range of digital input equipment. Two optical digital input ports and one coaxial digital input port to enable connection to a TV or other digital devices. Stream your favorite audio tracks from your Bluetooth-enabled portable devices via Bluetooth connectivity. Quick and easy pairing via the Bluetooth button on the front panel. Stores pairing information for a maximum of 8 devices. NFC (Near Field Communication) function for faster pairing. Multi-point Bluetooth connectivity that allows three Bluetooth-enabled devices to be connected simultaneously. Qualcomm aptX Low Latency decoding provides optimum time synchronization when playing back audio from video sources with no lip sync issues. Dedicated headphone amplifier circuit features a high-speed, ultra-low-distortion, wide-band op amp that’s paired with a fully discrete final output stage. Adjustable headphone output impedance, with 3 settings for low-, medium-, and high-impedance headphone types. 1/4″ / 6.3mm connector for compatibility with premium home and studio headphone models. For optimum placement versatility, the PMA-60 can be positioned either horizontally or vertically. Removable feet and included screw caps are quickly and easily re-configured. Elegant design with a combination of soft-look aluminum, bright silver tone accents, and a mixture of glossy and matte-black surfaces. Crisp OLED display shows the source selected via graphical icons and text, as well as the sampling frequency and data format of digital sources. 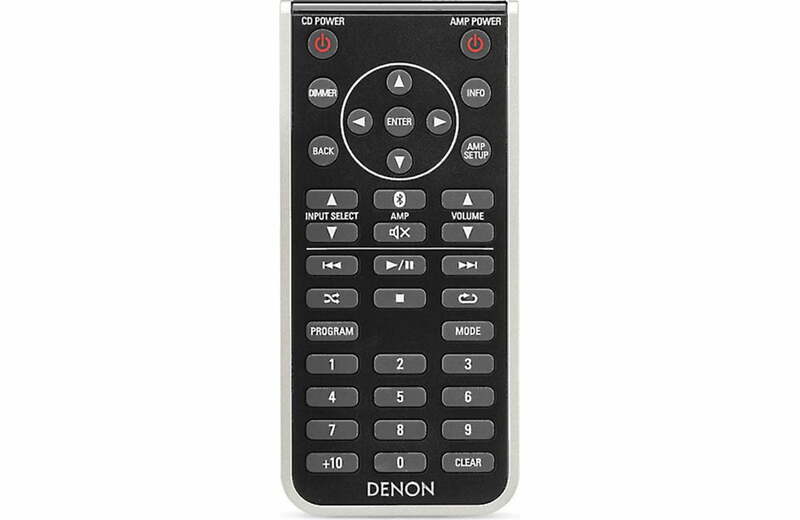 The supplied remote control features an ergonomically-designed layout that includes a cursor keypad, source select, volume controls, setup menu, back buttons, a Bluetooth button, and a display dimmer button. The remote has a 23′ range. Balance, Bass, and Treble controls. Source Direct Mode bypasses the sound-quality adjustment circuits for more faithful reproduction of original audio. Auto Standby automatically switches the unit to the standby mode when there is no input signal and operation for 30 minutes. If connecting to a TV, please make sure you can select “PCM” output in your TV’s audio menu. The built-in DAC cannot decode multi-channel Dolby® Digital signals. Denon Canada 3 Year Limited Warranty. I use Denon PMA-60 for a few weeks, no problems so far, sound is great(Polk Audio RTi-A1 small bookshelfs speakers,Nvidia shield player connected over USB input). 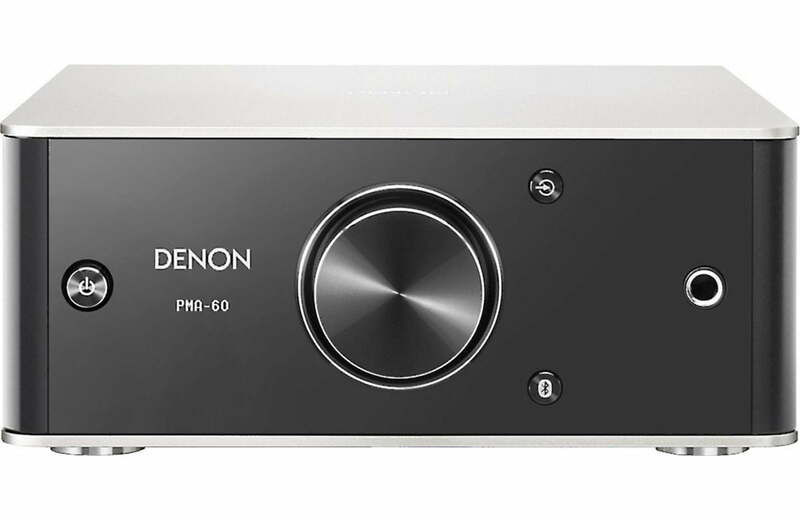 I can only compare this one with Denon-DA300USB DAC and Topping Amplifier TP60- digital) I think Denon PMA-60 has more clear sound.